Comparator tests use visual standards to assess the colour produced when reagents are added to a sample of water. Tablet reagents are used with these kits for maximum simplicity and convenience. 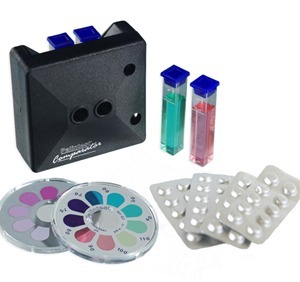 The Palintest Comparator with interchangeable colour discs is so simple to use - just add the tablet reagent to the test sample, place in the comparator and match against the appropriate disc. Colour discs are available for a complete range of water test parameters. Palintest discs are produced by the latest technology which enables the colours to be printed from a palette of over two million different shades - ensuring a perfect match against the colours product in each test. The long-lasting, wipe-clean polyacrylate discs conform to international dimensions and can be used in most standard comparators. Palintest colour discs are manufactured using colourfast inks and light resistant materials. There should be no loss of colour integrity of the standards with time. In a series of trials in which colour standards were subjected to continuous ultra-violet light for a period of one month, and to natural unshaded daylight for a period of one year, no loss of colour was observed. Users can confidently expect Palintest colour discs to give many years of satisfactory service under the recommended conditions of use and storage. The Palintest comparator and discs are available in complete test kit form or separately for use with existing equipment. It is easy to choose a water test kit to suit your application - whether it is just for one test parameter or for a dozen!